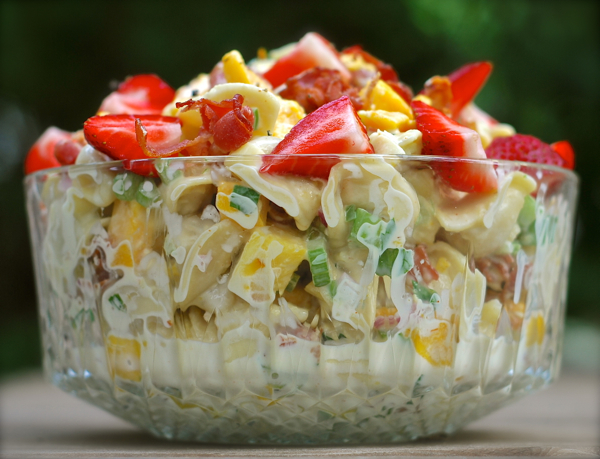 This salad is bursting with the tropical flavors of pineapple, ginger and mango. You can add smoky bacon or ham as a protein. It’s all mixed up with a dreamy, creamy dressing that offers a kick of spice from cayenne and jalapeno pepper. It’s topped with fresh, sweet strawberries. Oh, and don’t forget the lovely, cheesy tortellini pasta, which is the star of the show! Cook tortellini according to package directions for al dente pasta. Don’t over cook the pasta. You want it to be completely cooked but a bit firm. Once cooked, gently rinse under cold water until completely chilled. Drain very well. Place in a large mixing bowl. Fry bacon until crispy. Cool completely and crumble. Once completely cool, add it to the bowl with the pasta. Add: mango, pineapple, celery, jalapeno, and onion. Mix gently so everything is evenly combined. Mix all ingredients in a medium mixing bowl and stir until smooth, using a wire whisk. Pour dressing over salad and fold in gently, until everything is evenly combined and coated with the dressing. Take care when mixing so you don’t break up the tortellini. Transfer salad to a pretty serving bowl, and top with a bunch of fresh, quartered strawberries. Cover and refrigerate until ready to serve.